We’d love your help. Let us know what’s wrong with this preview of The Girl Guide by Christine Fonseca. To ask other readers questions about The Girl Guide, please sign up. I am so excited to bring this one to you. It's a book about resiliency and finding yourself at a time when I think it is increasingly hard to do so. Everything in the book has been kid-tested and is...well...fun! I hope you check it out and pass it along to a young woman in your life! I absolute loved this guide. I read and put my thoughts to paper, but then I gave this book to my 13 year old and asked her to read so I could get her opinion. I was not surprised when she finished and said, "wow, thats good". Now mind you, she was not happy with having to write her feelings down, she felt that is was "work", but once she started she really loved to look at how she felt. The best part of it for me was when she said, "We should use this book at our youth group". Yes, I felt valid I absolute loved this guide. I read and put my thoughts to paper, but then I gave this book to my 13 year old and asked her to read so I could get her opinion. I was not surprised when she finished and said, "wow, thats good". Now mind you, she was not happy with having to write her feelings down, she felt that is was "work", but once she started she really loved to look at how she felt. The best part of it for me was when she said, "We should use this book at our youth group". Yes, I felt validated because that is what I thought the entire time. I want to thank Prufrock Press and the author, Christine Fonseca, for providing me with and ARC of this book to read and give an honest review. Receiving this book for free in no way influenced my opinion or review. Before I get down to the nitty gritty, I can honestly tell you that I am not usually much of a non-fiction reader. I rather enjoy reading to get me out of reality. But, given the opportunity to review something for Christine Fonseca, I could not pass it up because I love her writing a I want to thank Prufrock Press and the author, Christine Fonseca, for providing me with and ARC of this book to read and give an honest review. Receiving this book for free in no way influenced my opinion or review. Before I get down to the nitty gritty, I can honestly tell you that I am not usually much of a non-fiction reader. I rather enjoy reading to get me out of reality. But, given the opportunity to review something for Christine Fonseca, I could not pass it up because I love her writing and I knew that I would enjoy the theme of this book. And enjoy I did! I also want to mention how much I love this cover. When Christine was searching for a cover, she asked a few of use to look at some designs and vote on which one we liked best. This cover is actually the one I picked! I love the message the t-shirt sends! Despite the fact that I am not a young teenage girl, the basic underlying theme of this book rings true to any woman of any age: be true to yourself, find what fits for you and use that to your advantage. Who couldn't like a book that aims to help people find their true selves? And Christine does not say this will be easy, in fact, she constantly reminds the reader that they need to dig deep within themselves to examine how to find themselves. So the guide helps girls see that life is not perfect, and that's ok. But it can turn out just as they want it if they find their true path. And the way in which Fonseca goes about it is great. Each chapter gives the reader an opportunity to put their new found life skill to work. She integrates exercises that truly help a person get down to their basic understanding of themselves. I love the fact that the entire book really relies on the reader taking on projects to lay their life out before them: journals, posters, flashcards, quizzes, short stories from women young and older, and quotes that get your mind turning. Fonseca asks the reader to do whatever it takes to help them really be in control of who they are and how they find their true selves. She lays out great strategies to help young teens deal with stress, friendship, parents, school work and so much more. If I had young girls, which I don't, I would grab this book right off the shelf and ask them to give it a try. As a matter of fact, I have three friends with daughters who would greatly benefit from reading this book, and they have agreed to do so! This is not just a book, it's a journey into the self that utilizes unique ideas to help young girls find their own unique self. I wish I had had a book like this when I was growing up. A big Thank You to Prufrock Press and NetGalley for giving me an ARC for a completely honest review. When I heard about this new book by Christine Fonseca I was right away intrigued. Being a mother of 3 girls, and one of them just turning 12, had me wanting to find out more. As a mother it is important to me to help my daughters feel important, and to try to give them the tools that can help them become better women in the future, and to grow up making wise choices. And as a mom sometimes I need A big Thank You to Prufrock Press and NetGalley for giving me an ARC for a completely honest review. When I heard about this new book by Christine Fonseca I was right away intrigued. Being a mother of 3 girls, and one of them just turning 12, had me wanting to find out more. As a mother it is important to me to help my daughters feel important, and to try to give them the tools that can help them become better women in the future, and to grow up making wise choices. And as a mom sometimes I need help with this teaching business. After reading the description I decided to request an ARC to see if it was right for my girls, and could also be a tool to help me. And what I discovered is a great guideline that Christine has written for growing girls, and a help to parents. The Girl Guide offers advice, guides, quizzes, exercises, worksheets, and goals to work on the help young girls make wise choices. There is help and advice for working out problems with friends and school. There are exercises and charts to fill out and make to help realize goals in life and what you can do to make them come true. It is a great book on helping teen girls find their own voice. And it has great quotes of wisdom spread throughout. Some of my favorite things were when it explains how to make a Dream Poster. I think this is a great idea for everyone. Writing out your dreams and posting up pictures can help kids stay on track. And it is great idea to have it displayed as a reminder everyday. Another topic I loved was the explanation of rules. I have found it hard to get my pre-teen to understand that a lot of rules are for her safety, and this was explained very well for younger people to hopefully understand. My most favorite idea in the book was keeping a gratitude journal. In a world that is becoming so negative and hard to survive in, I believe this is a great idea for everybody. I plan on getting all of my children a little notebook just for this that they can write a few things they are grateful for in it everyday. Hopefully this will make my family's lives more positive. I found this book a great tool and plan on buying it for my daughter as soon as it is published. Let’s be honest. Middle school sucked. With that out of the way, let’s get into The Girl Guide. It’s a great resource for girls struggling with growing up, especially those in the middle school years. I wish I’d had a book like this at that age. Instead, I just had my mom saying, “It’s okay. It’ll get better. You’re a great kid. You’ll make it through.” But moms just aren’t cool at that age. I was a huge reader and maybe having a guide like this would’ve helped me through those tough years. I thin Let’s be honest. Middle school sucked. I think like most 13-year-old girls, I struggled with who I was. I was still growing up and finding myself. I had the added stress of a chronic health condition that was surfacing. I didn’t handle life very well back then. The Girl Guide is a book that’s there to help girls struggling with the challenge of growing up. It’s there to give them advice and support as they struggle with bullying, with figuring out who they are and what they want out of life, with being yourself in this crazy, messed up world. The book is laid out in a great way: each chapter gives girls an area to focus on. I love this idea because if I had a kid struggling with something, I can point her to that chapter (or she could read the whole thing). Each chapter will help a girl find herself and her goals, deal with stress and everything life throws her way, and the friendships that she’ll have through her life. What I like is that it’s realistic. Life isn’t perfect, and Fonseca doesn’t make it out to be that way. But she gives advice and steps to take to handle those imperfections in your life. Best Bits: I've never accepted a non-fiction book for review before, but with my new job I couldn't pass up on the chance to peek inside this one. In my non-book life I work in counseling, and I often see middle school and teenage girls who are dealing with stress and anxiety. As such, I am always on the hunt for great homework resources that I can suggest for learning and thinking at home. I'm happy to say that this is a book I've suggested to other counselors, and may be a great resource for m Best Bits: I've never accepted a non-fiction book for review before, but with my new job I couldn't pass up on the chance to peek inside this one. In my non-book life I work in counseling, and I often see middle school and teenage girls who are dealing with stress and anxiety. As such, I am always on the hunt for great homework resources that I can suggest for learning and thinking at home. I'm happy to say that this is a book I've suggested to other counselors, and may be a great resource for middle school girls who are ready to work on a variety of issues. Here are a list of my favorite activities and topics from the book: My Boundaries, My Emotional Vocabulary, What Are Your Skills, How to Deal with Friendship Drama, Bouncing Back From Bullying. Okay, so that's a lot of language without a lot of description, but I think that it speaks for itself. Each chapter focuses on something different, and each topic is relevant. I think that a majority of us can look back to our middle school and high school days and think "man, I wish that I only had to deal with one of those topics, and not all of them at once". So, it's gets two thumbs up from me for content. 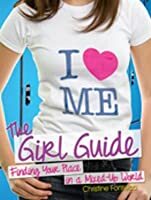 "The Girl Guide: Finding Your Place in a Mixed Up World" by Christine Fonseca, is a book that combines tips for loving yourself for who YOU are, and simple activities that help discover your personality. These activities can range from real life scenarios, to something as easy as a checklist. As you move through each chapter and activity, you seem to discover and learn something new about yourself. 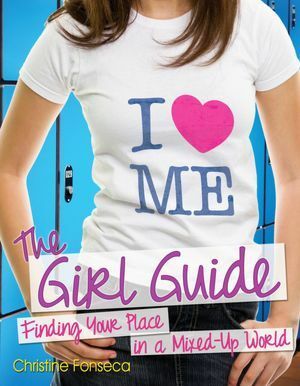 However, as the title suggests, I recommend this to girls, around the ages of 9 to at the most 15 "The Girl Guide: Finding Your Place in a Mixed Up World" by Christine Fonseca, is a book that combines tips for loving yourself for who YOU are, and simple activities that help discover your personality. These activities can range from real life scenarios, to something as easy as a checklist. As you move through each chapter and activity, you seem to discover and learn something new about yourself. However, as the title suggests, I recommend this to girls, around the ages of 9 to at the most 15 or 16. Although this is the age range I came up with, it really depends on each person. If one teenager lacks the confidence she needs in her life, it would be more important to read this book compared to a happy, self-satisfied 11 year-old. I enjoyed reading the chapters, as they have given me quite useful tips. The activities are enjoyable and fun, and help you get a better understanding of yourself. Raising teenage girls is hard in this day & age- Christine Fonseca has developed a great "workbook" for girls grades 7-9 on finding themselves while handling/dealing with the challenges & obstacles of life today. The Girl Guide helps young teen girls to learn and find themselves through fun "quizzes", journaling and quotes from other girls their age. The tasks performed, questions asked and quotes offer young girls guidance from Christine, other teens and themselves. I wish I had a Girl Raising teenage girls is hard in this day & age- Christine Fonseca has developed a great "workbook" for girls grades 7-9 on finding themselves while handling/dealing with the challenges & obstacles of life today. The Girl Guide helps young teen girls to learn and find themselves through fun "quizzes", journaling and quotes from other girls their age. The tasks performed, questions asked and quotes offer young girls guidance from Christine, other teens and themselves. I wish I had a Girl Guide when I was a young teen to help me along life's path. I received this book off of Goodreads First Reads. It was one of the first books I had won. This book is an adorable, delightful little activity book full of ideas, inspirations, and advice perfect for that growing and ever-changing preteen and teen girl. It's fun and definitely parent-approved, being a parent to a little girl myself. I loved this one and recommend it to all of my friends with young daughters---particularly those around the middle school age. This is a wonderful workbook for teen girls to work out their feelings and use their thinking to evaluate how they can better respond to things. Ms. Fonseca has done it again! In The Girl Guide, Ms. Fonseca brings all her expertise to the forefront to help girls navigate through the insane teenage years. I really wish I’d had a book like this to help me both find myself and find my path in life when I was growing up. I think a lot of painful mistakes and bad decisions might have been averted had I been a little more aware of who I was and who I wanted to be. And this book will help girls do just that. It’s easy to understand, professiona Ms. Fonseca has done it again! In The Girl Guide, Ms. Fonseca brings all her expertise to the forefront to help girls navigate through the insane teenage years. I really wish I’d had a book like this to help me both find myself and find my path in life when I was growing up. I think a lot of painful mistakes and bad decisions might have been averted had I been a little more aware of who I was and who I wanted to be. And this book will help girls do just that. It’s easy to understand, professional and relevant without being preachy, and really delves into the situations and emotions that girls out there are experiencing. If you are a girl struggling to find your way in a crazy, mixed up world, or if you are the parent of a girl who could use a little guidance, I highly recommend this book. This is a cute book for preteen and teen girls that focuses on being true to yourself while tackling some of the biggest issues girls face today. When Christine isn’t writing a book, she can be found sipping too many skinny vanilla lattes next to a Award-winning and critically-acclaimed author of fiction and non-fiction. Lover of books, lattes, and family. Passionate about humanity. Critically-acclaimed titles include Transcend, The Requiem Series, and The Solomon Experiment series, and Emotional Intensity in Gifted Students, second edition.